The overachieving, hard working, never-give-up band had Joakim Noah limping through 43 minutes on a swollen knee and Taj Gibson nursing a severely sprained ankle in the locker room the last 7:51. The Bulls had turned a nine-point fourth quarter deficit in another brutal and ineffectual shooting night into a bare 72-69 Washington lead with 2:18 left. And this was the Wizards team the Bulls thought they’d see, John Wall and Bradley Beal, as well as they’ve played, running away from shots, shot clock violations, stepping out of bounds with the ball, missing two straight free throws. “You take off the top player on any team, I don’t care, it’s a tough blow,” said Noah, who limped and dragged to six points, 18 rebounds, seven assists and three blocks. It was right there despite the ineptitude of the Bulls offense. Steal a win in Chicago, and then put this inexperienced Wizards team which hadn’t been in the playoffs for six years in the playoff pressure cooker and ready to burst. Having to win at home or face a Game 7 in Chicago. 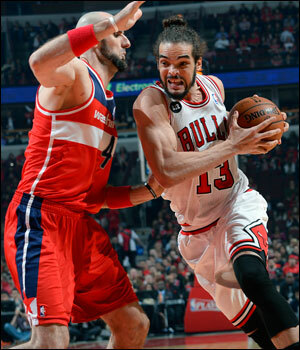 But with Gibson watching from the locker room, Noah unable to get much lift, the guards pretty much winded and Carlos Boozer in for a rare fourth quarter appearance, the Wizards got an astounding seven offensive rebounds in the last two minutes, most by Marcin Gortat against Boozer but the last by Nene over Noah. And even as the Wizards could only make three of six free throws in that two-minute stretch and missed all their field goals and committed two turnovers, the Bulls were shut out; the last indignity being Jimmy Butler on an inbounds play with 18.8 seconds left and trailing by three missing a point blank layup, one of 16 mostly uncontested layups the Bulls missed in the game. And so this feel-very-good season for all the Bulls did after losing Derrick Rose to another knee injury after 10 games and seeing Luol Deng traded in January comes crashing to a stop in five playoff games. Yes, you are what your record says you are, as Bill Parcells famously noted. And the Bulls are a first round playoff team and no more. Though favored because they had the home court advantage and 48 wins to 44 for Washington, they were less a favorite given the circumstances. Nene, who was the star of the series and had 20 points back from suspension Tuesday, returned in full health after missing 29 games this season. The young Wizards with Wall scoring 24 points and Beal adding 17 were at their fittest and best. Because the Wizards were inconsistent all season, losing down the stretch after big leads nearly a dozen times, the consensus was the Bulls veteran savvy, experience and relentless physical play would be too much. But in Nene and Gortat the Wizards could match the Bulls up front (Washington outrebounded the Bulls by 10 in the series and by six in Game 5), and in Wall and Beal the Wizards had young, high lottery pick stars. The Bulls’ was still in rehabilitation. So the Bulls had to give everything they had for as long as they could to be where they were. “Those first two games we lost (blowing double digit second half leads at home) we felt we should have won, took a lot of energy and emotion out of us,” said Augustin, who was one of 10 in Game 5 and struggled after a strong Game 1. In a sense, the Bulls had to play like they did to get not only where they were but in position for a home court advantage to have a playoff possibility. There’s always this notion that the Bulls play hard all season and other teams don’t and then they turn up their games and the Bulls cannot any more than they have. That’s a fallacy. The playoffs is about talent more than the regular season. In the regular season, if you are well prepared and efficient and relentless and compete like the Bulls do, then you can steal a few wins another team might not get. Not because they aren’t trying; you are just better prepared, which is a strength of Bulls coach Tom Thibodeau. But in the playoffs with no back to back games and extensive scouting by everyone, talent generally wins out unless there are fluke wins. There weren’t in this series, and the Bulls let their chances go availing when they failed to close those first two games at home. “Disappointed, that’s the word,” said Mike Dunleavy. “Felt like we could have given a better performance. In terms of competitiveness of the series they beat us; they deserved to win the series. Disappointing the way we played at home. At the end of the day, it was a rewarding season and we’ll keep our heads high. You sit back and think about it, we’ll appreciate the season we had with all the turmoil. It was in the end perhaps appropriate as the Bulls battled and clawed and tried, but there was nothing left. Dunleavy with his sprained thumb from Game 4 had five points. 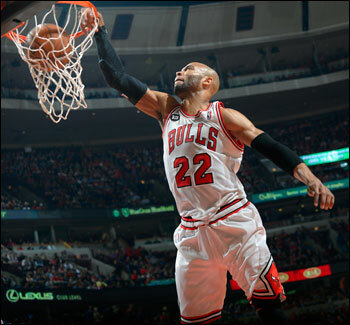 Gibson, the Bulls star of Game 4 with 32 points, left with 12 and three blocks. The team doctors spent as much time in the post game locker room examining players as the media was asking questions. It all perhaps was symbolic of a grueling, often uplifting but inexorable season. “We put so much work into this season; came out of countless holes. I’m (upset),” said Gibson. “A lot of times we were digging ourselves out of 15, 10 point leads and trying to fight back (in this series). Fourth quarter you have no energy, you’re running on fumes. You look at every game we played this series; we were fighting back. We never once had the lead in the first quarter; we always came up short and that’s not our style of basketball. “That’s frustrating because we really worked hard; I’m (upset) because we had a really hard season and guys put in the effort and you want to get rewarded when you put in the effort,” said Gibson. “I think they executed well; we just didn’t match the energy they had to start games, finish quarters; we turned the ball over a lot. Rebounding was even, but tonight late in the fourth quarter we did not finish rebounding. You got to give their guys credit; big season for them. We just have to do better. That’s the fear with a team like the Bulls and those windows. They’ve been the team everyone wants to avoid for four years now, tough and persistent, obstinate and pugnacious. That doesn’t take you far enough; it gets you a lot of pats on the back and perhaps some free meals. But at some point if you stop moving forward you are moving backward. “I think we’re a good team, but we’re trying to find a way to get over that hump, to get to that next level,” agreed Noah. “The only thing I can do is get better individually, be ready for next season. I don’t know what the future holds in terms of who’s going to be here and stuff. But all I can say is I appreciate the guys who were here this year. I’ve never been around a group of guys who worked their (butts) off from the beginning to end. Again, it was the start, trailing 23-15 after one quarter with yet another comeback to make in a series in which the Bulls trailing early was the constant. The players and coach talked endlessly about it; but words could not change actions. 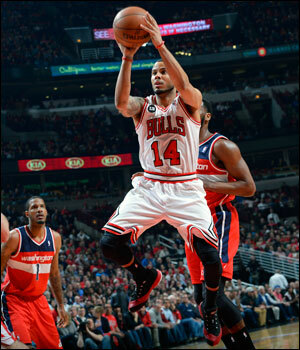 The Bulls were playing an iron man seven; but basically so were the Wizards. “I thought we moved the ball well in the first half,” said Thibodeau of the 41-41 tie. “I thought we took care of the ball. We had 13 assists and one turnover (in the first half). Then we turned the ball over in the second half (10). We didn’t make shots (31 percent second half for the Bulls, but 35 percent for Washington). I thought we were in position there at the end, but couldn’t come up with the free throw rebound. The fight was there, the spirit was there, the togetherness of the team was there throughout the year. We are not making any excuses. They beat us. They played better than we did, but I am very proud of the team. “It was a hard fought series,” said Thibodeau. “Maybe we could have done a little better in the first two games; they got away from us. You could put it on fatigue (zero Bulls second half steals); you can put it on we just didn’t get it done. We didn’t get to two loose balls we lose a game? Not because we are tired; everyone is tired this time of year. I was looking at Bradley Beal; he played 43 minutes. In the playoffs, that’s what people do; the best players play big minutes. There are no back to backs. If we want to use fatigue as an excuse we can. But the best players play and they play big minutes in the playoffs. All seasons are picked over for what else could have been done. Play this guy less; put that guy in. More bench, different lineup, different matchup, different rotations. But the issues presented themselves were apparent. The Bulls didn’t have enough shooting, and there’s only so much you can do to make up for losing two 20-point scorers. That you did is impressive; that you couldn’t do more is disappointing. It’s always been a season more about disbelief. The Bulls had a disastrous third quarter shooting four of 16 and scoring 11 points as Beal and Nene continued to make jump shots, Noah’s frustration evident as he wasn’t able to thwart Nene as he’d have liked on his throbbing knee that he was treating in every timeout but never leaving the game. The Bulls players didn’t have enough, but never stopped giving what they had. “It always ends quick,” said Hinrich. “You don’t even come into a game expecting it to be the last time. I thought we did better than we did in the previous games. We were right there with them, but we were struggling to score. You want to keep playing ball, but you have to give them credit. They out played us in the series, obviously, and we’re going home. That third quarter left the Bulls trailing 61-52. But with a pair of threes from Hinrich and Butler and then a Boozer jumper for his first fourth quarter points of the series, the Bulls were there to steal it, trailing 70-67 with 3:32 left. Wall made a jumper, but Augustin drew a foul with 2:18 left and made both to stay within three. The Bulls defense rose up and the next five times the Wizards had the ball they missed three shots and committed a pair of turnovers. But limping and gasping the Bulls couldn’t score again, a vital player watching while being treated, another limping through every step, others trying to grab a breath. It’s who they are and they went as far as they likely were capable.